Will scientific dreamers populate worlds of the future? Buddhist tradition says that Lord Gautama the 'Awakened One' paid three visits to ancient Sri Lanka during his lifetime. Modern scholars have long scoffed at the idea, but remarkable findings by scientific research teams around the world now see a possible basis for such extraordinary visits. Scientific studies of lucid or yogic dreaming may lead to undreamt-of applications in the communications, entertainment, and travel industries. Yogic dreaming could even help us to save the Earth's living environment and to make other worlds such as Mars suitable for human habitation. 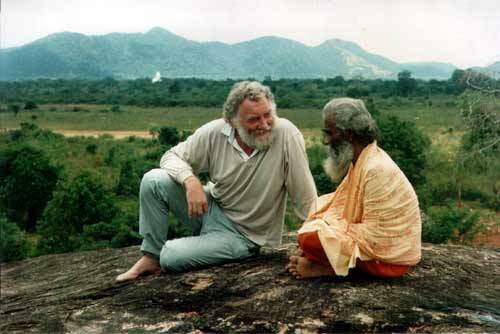 Distinguished environmental scientists such as Dr. David Bellamy (left) have taken a keen interest yore and legends of Sri Lanka's living traditions including yogic dreaming. Above, Dr. Bellamy and Matara Swami on location in Kataragama during the filming of Routes of Wisdom. Until the introduction of modern ways of thought during the colonial era, oriental people generally neither questioned nor disputed their own oral traditions. Accounts of Lord Buddha's reputed visits to ancient Lanka and even to other lokas or parallel worlds, for instance, were part and parcel of a vast integrated body of inherited lore of which only a little was stored in writing while most by far survived in living succession from generation to generation through a network of thousands of durra communities. With the rise of a European-minded system of values and education, however, the living oral and per formative traditions of the rural hinterland have come to be regarded as the domain of backward, superstitious villagers who obviously did not know the truth behind their own �unhistorical legends'. Today's front-line scientific research teams, however, have been taking a fresh look at traditional village lore and they are discovering that there could be far more truth to village traditions than modern folks had ever dared to imagine. According to local tradition, Lord Buddha came down from North India to visit sixteen sacred sites in ancient Lanka in the course of three visits; modern historians consider the tradition to be a pious fiction. Similarly, Lanka is said to have been inhabited by devas, asuras, yakshas, nagas and kindred other-worldly spirits long before humanity arrived on the scene and man, such as the Kataragama god or spirit, still live here according to popular belief. Even today, reports still surface purporting to tell of visits to other worlds or other-worldly beings visiting Sri Lanka. Did Lord Buddha actually visit ancient Lanka? Longstanding tradition throughout the Buddhist world insists that he did indeed come here. Not, however, by boat or by flying machine, say Buddhists, but by virtue of the Buddha's all-encompassing comprehension of reality manifesting to observers as iddhis or marvelous powers. Modern scholars, however, have found no concrete evidence, like inscriptions, to support this view and historians insist that the historical Buddha never left North India during his lifetime. Now it appears that historians and other modern skeptics may have been barking up the wrong tree. Scientific research teams working in a variety of fields have lately been turning their attention to indigenous wisdom traditions that had been in partial eclipse for centuries and the discoveries they are making are often astonishing. The reputed marvelous abilities of ancient seers and sages, these scientists now believe, may represent only the tip of the iceberg of yet-unfathomed powers that may someday be harnessed once again to transform today's troubled world even beyond recognition. For several years now, scientists at the Stanford University Sleep Laboratory and at other dream research laboratories in America and Europe have been studying and experiencing for themselves states of consciousness that have long been familiar to Oriental practitioners of 'dream yoga' as it is broadly understood among its exponents. Oriental wisdom traditions typically liken our waking world to a vast dream from which very few awaken within the short span of one dream-life. But for those who do wake up within the dream � like Lord Buddha among others � life and death hold no terror and the very substance of the universe itself seems to bend as if in obeisance to them. The case of Lord Buddha is characteristic, if not typical. When first asked to account for his divine composure and luminous presence, the sage of the Sakya clan explained that he was samma sambuddha, which in plain English means 'one who is completely, perfectly awake'. That is to say, he had fully woken up from our great collective dream of samsāra, the repetitive 'sorry-go-round' of imagined material existence, even as the dream was still in progress for others around him. Thus, he was not 'enlightened' from above as early Western scholars mistranslated the word, but awakened from within a deep and vast dream, as it were. And this self-description, it seems, was not a mere teaching device or metaphor but the precise and self-consistent account of a genuine scientist's successful research conducted upon himself. Canonical Buddhist tradition also records that, employing but a few of the iddhis or marvelous powers that arose as a result of Lord Buddha's awakening from the dream that others call 'reality', he visited other worlds including the lofty Tushita heaven where he paid his respects to his deceased mother. It is still widely accepted among Buddhists that the Awakened One, because of his self-mastery and all-embracing comprehension, was capable of visiting any corner of the myriad universe without even leaving his seat. Needless to say, this included ancient Lanka and other places on earth, too. Constrained by modern beliefs and expectations about what is humanly possible and what is not, however, Westerners and modern-educated Orientals have been unprepared to accept accounts that do not conform to their own assumptions and patterns of thinking. Hence, they typically highlight and approve selected passages in books that seem to resemble and confirm Western schools of thought, while summarily dismissing as 'fantasies' the Jataka stories and accounts of Lord Buddha' reputed visits to Lanka, let alone to other worlds. Thus, even in canonical passages where the Buddha likens this world to a dream, a bubble, or a magical show, scholars conditioned by modern education can concede only a poetic or metaphorical sense to the Buddha's words. But now modern science itself is probing deeper than ever before into human consciousness and already its discoveries are already its discoveries are posing challenges to deeply-held modern assumptions concerning next to everything under the sun. Specifically, psycho-physiologists at major universities in Europe and America have been making breathtaking advances in the field of dream research in the pas two decades, especially with regard to lucid dreaming, whereby dreamers regain waking consciousness even as normal dreams are still in progress. Lucid dreamers, in addition to flying, breathing underwater, and passing through 'solid' objects, have also shown themselves capable of undertaking pre-arranged research experiments within their lucid dreams, very much as the siddhas, saints, and dream masters of oriental lore are reported to have done from remote prehistory right up to modern times. 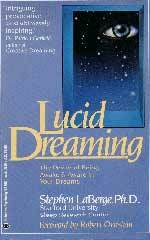 "During non-lucid dreaming," he says, "you tacitly assume that you are awake; during lucid dreaming, you know that you are asleep and dreaming." The close affinity of such findings to standard Buddhist theory and practice has not escaped the notice of Dr. LaBerge and other researchers. This has led them to study the dreaming techniques not only of Buddhists but also of Sufi dream masters and indigenous schools of dream yoga that still survive in places like Sri Lanka. Taking full advantage of indigenous wisdom traditions, Western researchers have made brilliant advances in a very short time and now appear poised to overtake their Oriental counterparts in a crucial field that was long the uncontested domain of Oriental masters. Not only have lucid dream researchers gained valuable experience in learning how to visit distant places in the blink of an eye, but there is mounting evidence for the validity of mutual or shared dreams in which two or more dreamers meet in the same dream environment. This hallowed dream technique, whereby Sufi dream masters still continue to convey teachings and instructions to their murders or disciples to this day, may also be related to accounts of marvelous but unhistorical full-moon assemblies of the Buddha with his company of accomplished arhats, devas, gandharas and other exceptional beings, including deputed assemblies in ancient Lanka. Not too surprisingly, traditions of dream yoga -- including dream-exploration of sacred localities -- are still preserved and practiced at places like Kataragama that are associated with marvelous visits of meditation masters including Lord Buddha. Experienced dream researchers in Sri Lanka affirm, for instance, that a subtler, interior Kataragama exists in a subtle world parallel to our own and that events in that world presage events in our own world. The same living tradition, in fact, maintains that our planet Earth and everything upon the face of it, has been created and sustained by dream activity, very much as Australian aboriginal peoples preserve their memory of the Dreamtime, when powerful ancestor-spirits shaped the landscape itself. If indeed there is also truth in these pervasive indigenous traditions that associate lucid or yogic dreaming with the process of designing wholesome, fertile living environments and actually creating them in some sense, then this knowledge could have literally undreamt-of possibilities and practical applications, especially in restoring the ecological balance here on Earth and perhaps on other worlds as well. No less a distinguished scientist and visionary than Dr. Arthur C. Clarke is even now conducting Sri Lanka-based experiments with computer programmes designed to chart the eventual telltale-forming of planet Mars to make it into a garden world for human settlement. Another celebrated British scientist who sees vast potential applications for Sri Lanka's indigenous traditions of environmental management is Dr. David Bellamy. A distinguished botanist, 'green' activist and television celebrity in his own right, Dr. Bellamy and research associates have been exploring and documenting on film a great deal of evidence that, analyses from a number of perspectives, tends to support the validity of living oral tradition. Dr. Bellamy and associates over a three-year period have assembled a six-episode documentary series filmed entirely in Sri Lanka entitled Routes of Wisdom for international release. Were ancient seers and sages like Lord Buddha really capable of coming and going by instantaneous, non�physical means? Certain occasions, like the full moon, and certain powerful places, like Adam's Peak or Kataragama, are still believed to provide favourable 'windows of opportunity' for subtle information-gathering and even for passage to parallel worlds. Lord Buddha's visits to ancient Lanka, for example, are associated with the full moon of Duthuru (January). Just last Duthuru full moon, this writer was in Kataragama conducting research by day and by night with special attention for possible evidence of portals or gateways connecting Kataragama with other worlds. That very night, while asleep within the sacred premises, I experienced for the first time a vivid dream-representation of these legendary portals between worlds. The dream, in the last watch of the night, placed me before a dark, flat, stone-like surface. I felt or 'knew' that it was one face of an indefinite-sized stone cube, i.e. having six faces. It seemed to be inert. My attention was attracted by what appeared to be a painting of a plain double curtain directly in front of me at little more than an arm's reach. Suddenly, the painted curtain became animated and drew itself back to reveal a dark portal. I could sense that there was some mystery or presence within, but I could not see deeply with my eyes alone. Nor did I try to move, as I was transfixed by the spectacle before me of deva-dutas or divine messengers darting in and out as bolts of light. I felt fortunate to see it. The emotive impact of the dream forced me to wake up abruptly. I marveled at its obvious affinity to the hidden gateways of local tradition. I had never imagined or pictured anything like this, however. I recollected my dream perceptions and gave silent thanks to the dream's unknown source. Like all dreams, of course, it was not strictly objective. Rather, it was a mere representation -- albeit a most convincing one to the dreamer -- of something that has long been known of among local dream researchers, many of whom have undoubtedly gone much further than this researcher in fathoming what deeper reality lies behind such dreams. Already, perhaps, scientists have crossed a momentous threshold.